Ainize Cidoncha Markiegui came to the Industrial Technology and Management program from Universitat Politècnica de Catalunya (UPC) in Barcelona, Spain, to complete her master’s thesis. A Special Project was part of her Master’s degree in Advanced Mathematics and Mathematical Engineering. Her goal was to do an interdisciplinary project using applied math and best practices in operations research to solve a significant business problem. She chose to study Chagas Disease a deadly tropical disease that affects an estimated 6-7 million people in South America as well as 80,000 people in Spain, and is more common than Malaria. She completed the project with supervision from INTM Industry Professor Gurram Gopal, whose Ph.D. in Operations Research and work in international companies fit with her interests. In addition to working with Gopal, Ainize was also given the opportunity to do field research in Bolivia with a team from The Institute for Global Health (ISGlobal) based in Barcelona. 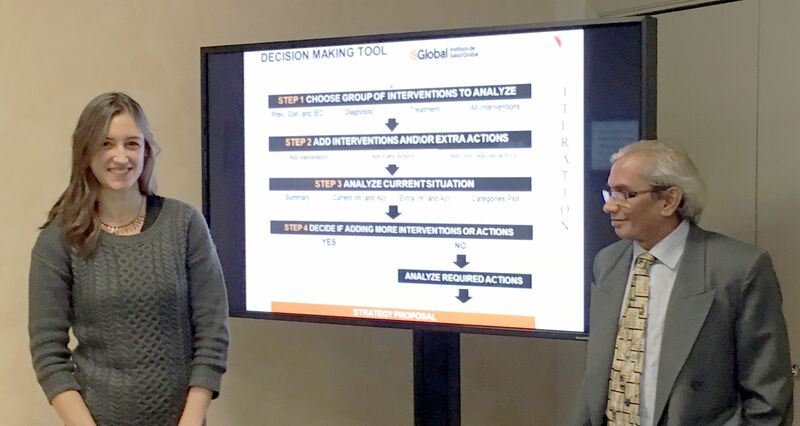 Her project, “Strategies For Expanding The Care For Chagas Disease In Bolivia: A Multi Criteria Decision Analysis” developed a strategy construction tool to help assist and guide stakeholders in the management of Chagas disease in Bolivia. This report included viable strategies to expand the care provided by the current pilot platforms through the primary health care system. The work earned highest honors from UPC, and is being used by ISGlobal as a model for scaling up the care of Chagas disease in Bolivia and Spain. It also was one of just a few projects selected for oral presentation by the organizers of the INFORMS Health Care 2017 Conference, Optimizing Operations & Outcomes. INFORMS is the leading professional association for Operations Research. The conference, held every other year, is intended to help operations researchers from all over the world use data effectively and share resources to develop solutions and innovative ideas to address challenges in health service operations and outcomes. You can learn more about Industrial Technology and Management programs at Illinois Institute of Technology here. Learn more about Special Projects here.